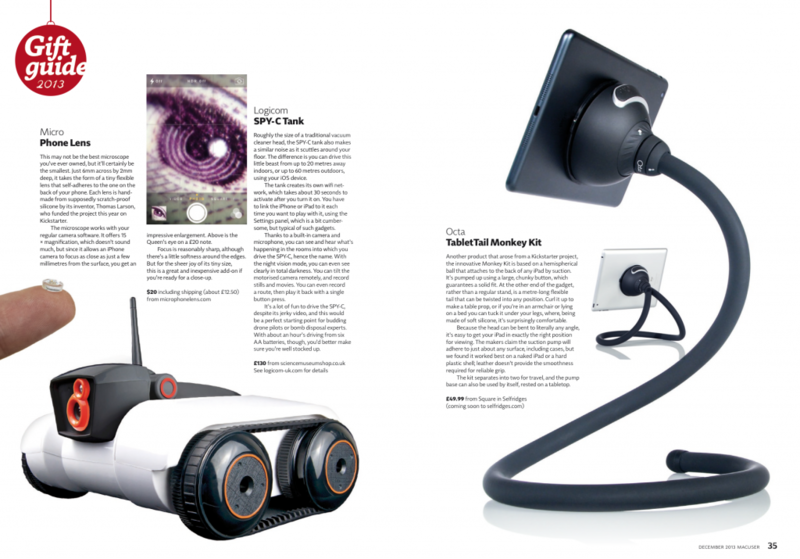 MacUser is a British publication bringing up-to-date tech news to readers each month. Their 2013 Gift Guide included a Travel Vest, some stylish headphones and the TabletTail:Monkey Kit iPad stand. “Another product that arose from a Kickstarter project, the innovative Monkey Kit is based on a hemispherical ball that attaches to the back of any iPad by suction. It’s pumped up using a large, chunky button, which guarantees a solid fit. At the other end of the gadget, rather than a regular stand, is a metre-long flexible tail that can be twisted into any position. Curl it up to make a table prop, or if you’re in an armchair or lying on a bed you can tuck it under your legs, where, being made of soft silicone, it’s surprisingly comfortable. Because the head can be bent to literally any angle, it’s easy to get your iPad in exactly the right position for viewing. The makers claim the suction pump will adhere to just about any surface, including cases, but we found it worked best on a naked iPad or a hard plastic shell; leather doesn’t provide the smoothness required for reliable grip.